The earth has warmed in the quarter century since I grew Dr. Martin. The growing season is longer and summer temperatures are hotter. So this spring I thought it was time again to try growing some big, fat, flavorful lima beans. King of the Garden was the variety at hand, a variety perhaps as good as Dr. Martin. I started the seed in spring in pots indoors and planted out the seedlings, 2 per bamboo pole with 3 poles tied at their tops to form a teepee, a the end of May, by which time hot weather had worked its way into both air and soil. King of the Garden plants grew, and grew, and grew. And flowered, and grew, and grew. And occasionally, I noticed a little, very little, pod beginning to develop. But no flowers or mini-pods grew to become large pods filled with big, fat, flavorful lima beans. Lima beans are a finicky lot. Not only do they shiver in cool weather; they also underperform in weather that’s too hot. Like the hot weather we had, at times, this summer. More recent, cooler nights should improve pod set. That is, unless something else is the roadblock to pod production. That “something else” could be stinkbugs. Stinkbugs and stinkbug problems are moving north from their more traditional southern haunts. There were plenty this summer. The buggers enjoy limas. Moving over to another bean, green beans, my third and last planting of which is now being feasted upon by Mexican bean beetles. (They also feed on the limas, but not enough to cause significant damage.) Mexican bean beetles are not something new that’s become more problematic with warmer summers and winters; they’ve been showing up in my garden for decades although few other gardeners with whom I speak seem to have problems with them. Despite the beetles, I harvest plenty of green beans; my main beef with the beetles is that they keep me from being able to grow pole green beans. 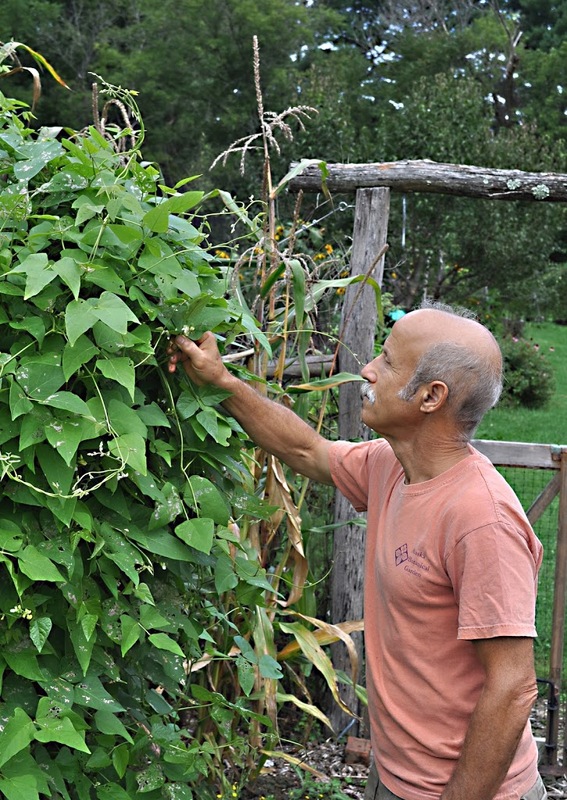 Pole beans, unlike bush beans, which get sequentially planted and then pulled out after a few weeks of harvest, are a long season crop planted in late spring to grow and bear until frost. That long season of growth offers a 24/7 dinner to bean beetles. Growing only bush beans restricts my choice of varieties and makes growing and harvesting the beans, for fresh eating and for freezing, more frantic. This year, I tried to check bean beetle infestations with weekly sprays of neem, a relatively nontoxic pesticide derived from the Indian neem tree. It was ineffective. Another possibility is to elicit the help of a stinkbug! No, not any old stinkbug but one known as the spined soldier beetle, a predator a many plant pests. These bugs can be purchased as such or pheromone attractants can be purchased to attract them to the garden. I tried the traps many years ago to no good effect. Perhaps it’s time to import the bugs themselves. One bean that seems to be pretty much ignored by bean beetles and stinkbugs, and any other pest, is soybean, which I harvest green as edamame. The edamame harvest this season has, as usual, been excellent. I grow the variety Shirofumi, both for its flavor and good yields. Edamame usually flower and ripen pods in response to daylength, and Shirofumi edamame harvest ends in early August. Then, I usually pull the plants to make space for late plantings of cabbages, radishes, lettuce, and other cool weather vegetables. This year, the space was not needed so I decided to leave the plants in place. 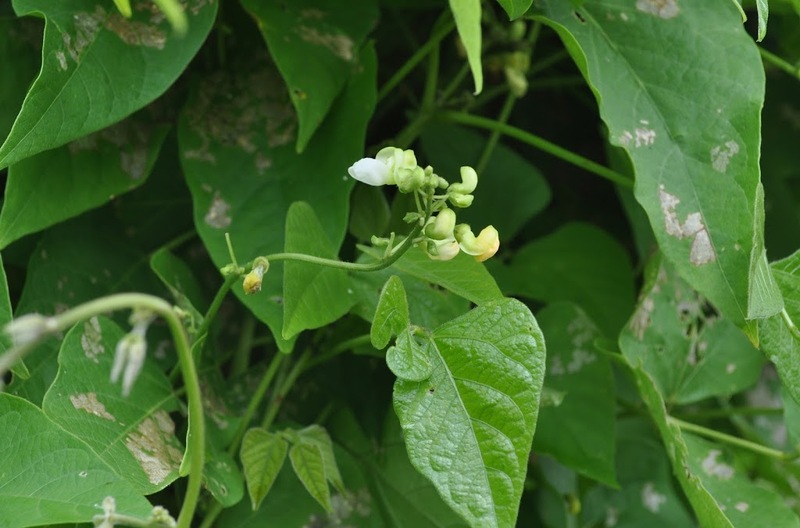 Soybeans, along with green beans, lima beans, and other beans, are legumes, which are plants that, with the help of symbiotic bacteria in their roots, can use nitrogen from the air as food. Much of that nitrogen becomes the protein in the soybean seeds; the rest is in the leaves, stems, and roots. Leaving my soybean plants in place is helping to enrich the soil with nitrogen, from old roots that slough off. The rest of the plants, once pulled, go into the compost pile to provide nitrogen there and, as the finished compost is spread, subsequently in the garden. My lima bean plants, even if they remain podless, provide those same benefits. The same goes for my green bean plants, from which I’ll get a little extra nitrogen from all the Mexcan bean beetles on their leaves. 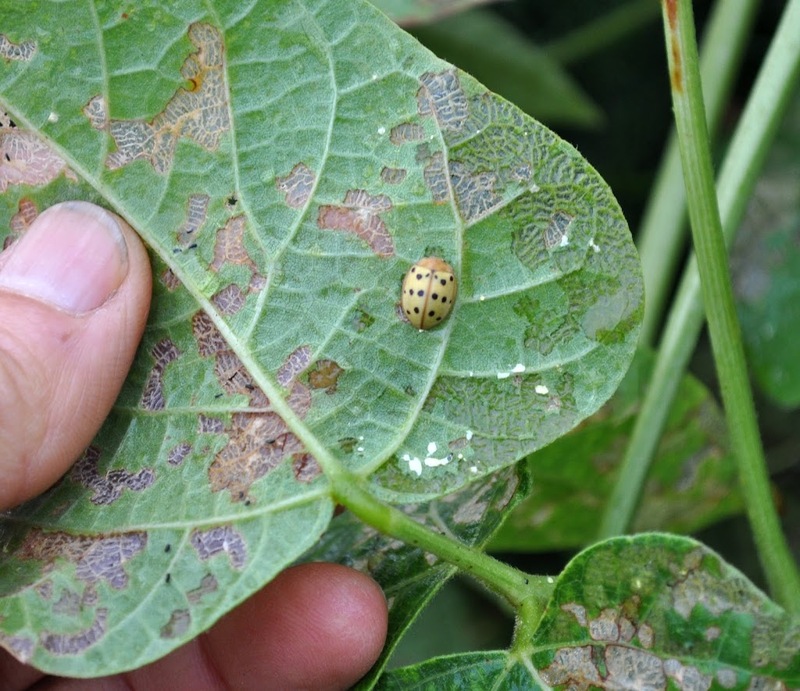 This entry was posted in Gardening and tagged bean beetles, beans, edamame, lima. Bookmark the permalink. Trackbacks are closed, but you can post a comment. I haven’t figured out the Mexican Bean beetles. My first garden in Poughkeepsie (1980) was over run by MBB, and they are bad at Vassar farm. However, only once in 15 years have I had a MBB in my home garden which is midway between & 2 miles from Vassar Farm and my first garden. Until this year edamame has been mostly trouble free – but this year I lost 80% of the crop to MBB and to stink bugs, both brown marmorated and green. Next year I’ll plant them under a row cover. My neighbor across the street doesn’t get bean beetles even though I do, every year.